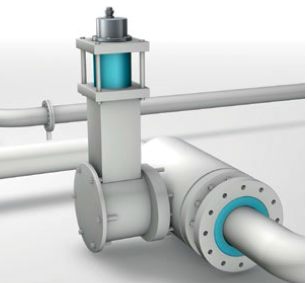 Hydraulic actuators can be used to open and close a valve’s position. 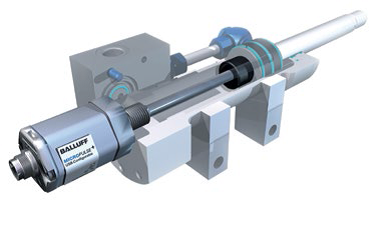 In automation architectures, a linear position sensor is used within the hydraulic actuator to provide continuous position feedback. The linear position sensor is installed into the back end of the cylinder. The sensing element resides in a cavity that has been gun-drilled through the piston and cylinder rod, extending the full length of the mechanical stroke. A magnet ring is used as a position marker and mounted on the face of the piston. As the piston (and the position marker) move, the linear position sensor provides a continuous absolute position by way of an analog or digital signal. In some applications, a cylinder’s position may only be moving across a small portion of the overall stroke or a specific portion of the stroke. The end user could benefit from altering the transducer’s signal based on the application’s specific stroke requirements instead of the entire cylinder’s stroke, thereby maximizing available position resolution. When this situation arises, most transducer manufacturers offer the ability to customize or “teach” a modified output of the stroke via push buttons or from wiring inputs. When this is done, the process does require the cylinder (and position marker) to move to these defined locations for a “teach”. from a PC via USB to a compatible linear position sensor. Starting and ending stroke values can be precisely entered into the software and a graphical representation of the output curve is created. For a more straightforward approach, you can also drag and drop these stroke points by a click of a cursor. 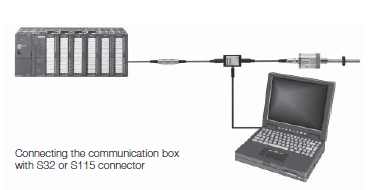 The file can be saved on a PC and downloaded to the transducer. In either case, the cylinder’s piston doesn’t need to be actuated. 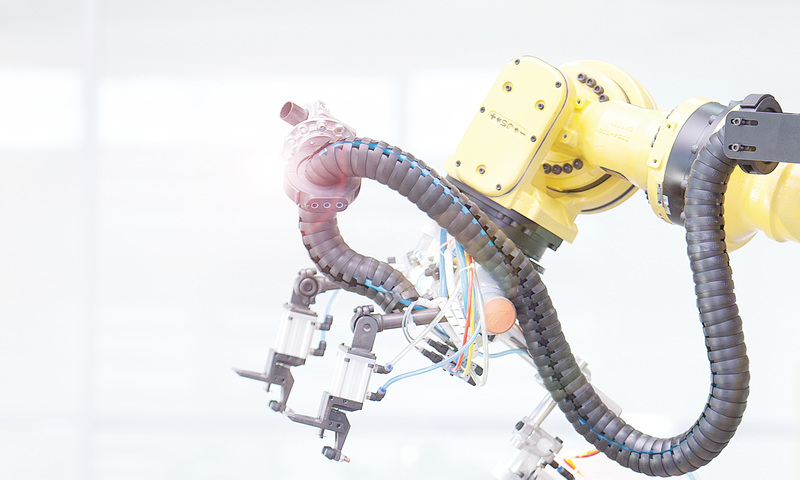 In projects where multiple, identical actuators and linear position sensors need to be customized, the setup would only need to be done once, the file saved, and simply uploaded to all the sensors for the project. A great time-saver over manually teaching each and every sensor. Another benefit to using software with linear position sensors is to be able to upload programs for replacement units in a safe user environment (e.g. lab station or office) and shipping them to various job sites. These different locations (or locales) can be in harsh environmental conditions (extreme cold or heat) or areas that contain ignitable or explosive gases or dusts which may be difficult to work in. Other software features include inverting the output curves, offering position or velocity outputs, and more. 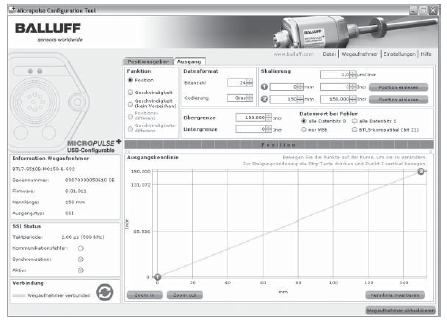 For more information on Balluff’s Magnetostrictive Linear Position Sensors, visit www.balluff.com. I am responsible for growing the BTL Micropulse Linear Position Sensor portfolio across various customer industry segments across the United States. These specific products have a greater focus in applications involving hydraulic cylinders, plastic and/or metal extrusion machines, stamping presses, and many more. Based on specific industries and/or applications, I will identify key customers, cultivate my relationship at the accounts, and grow our BTL sales within them. Additionally, I'll be increasing our brand recognition by joining and participating in industry societies and organizations. Balluff is a leader in Object Detection, Identification, Connectivity, and Measurement. For more information, please visit our website at www.balluff.com.